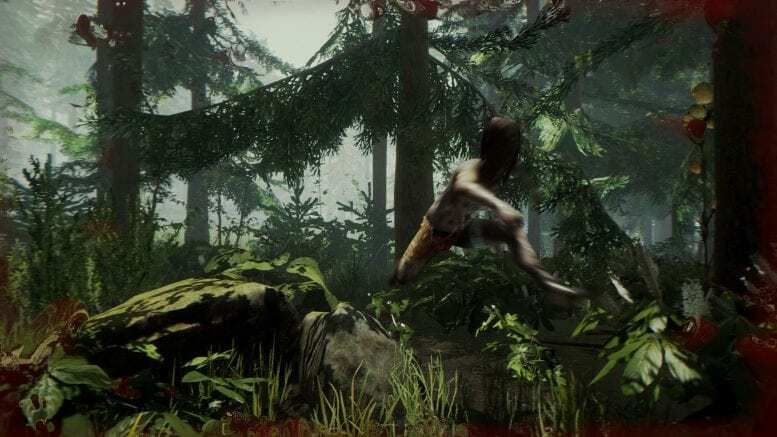 SPOILER ALERT: This article contains spoilers for the video game, The Forest. The Forest started off strong. You’re stranded in a forest after a violent plane crash with a strange creature taking your son after the crash. You pick up an axe and survey your surroundings, maybe explore a little bit and run around with your friends. (Assuming you’re playing with them.) And then you see them–strange humanoid creatures running around in packs, and you’re forced to slash them with your axe, or you run away as you look behind you, anxious they’re on your back. This is the fun part of The Forest. And you better enjoy it, because it’s probably going to be the only fun you’re going to have. Actually, I take that back. There is some fun left to be had. You may waste some time building up a base, defending from attacks from the creatures. Then the boredom kicks in. You haven’t seen anything new for like two hours, and you’ve just been building and chopping down trees and building–repeat, repeat, repeat. At least this is how my first few experiences with the game went, and considering how much time I have spent just walking around and finding nothing, I can assume that finding and actually being able to survive the cave system is not something a lot people do in their first hours. That’s a shame considering IT’S THE BEST PART OF THE GAME. What I’m saying here is that the actual story and well built, scripted things in the game are hidden in the vast environment. The entrances to the cave system are just a few small holes in the ground with ropes hanging down them, and this is sad because I truly had a really fun time exploring the complex cave with my friends while fighting the unique mutated enemies that are down there. We may have encountered a few buggy moments and maybe a few moments that were a little harder than expected, but these were easily passable. We could just use our heads and maybe throw some dynamite in strategic places, or rush in as one group instead of one by one to defeat whatever giant creature we were fighting. When we exited the cave, thousands of feet away from were we entered, we could see why we thought all hope we had for The Forest would be fulfilled. We really thought that we were maybe going to finally progress with the story and continue finding new things and find new challenges to overcome afterwards. We were wrong. We eventually quit the world after being put back in that loop of boredom previously mentioned. In my opinion, the developers of The Forest just don’t know how to make something stand out. The one thing I thought would actually lead to something interesting other than the cave system was a giant mountain, looming over the island. We later found out that attempting to climb the mountain throws you down as an invisible wall blocks the way up. I think this is a perfect way to summarize The Forest.